Benjamin Franklin once stated: "In this world nothing can be said to be certain, except death and taxes." 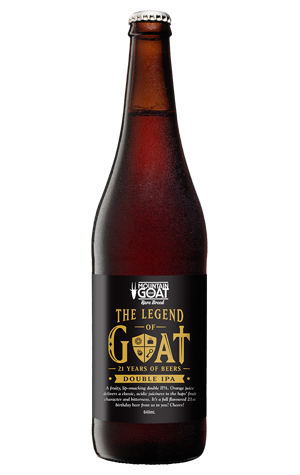 Had he lived a couple of hundred years later, he may well have added: "And that Mountain Goat will celebrate milestones with an IPA." And why not when the brewers make them so well, a skill to which a couple of champion IPA trophies can attest. As for the latest milestone, it's now 21 years since the first Hightail was poured. Back then, Melbourne’s beer scene was a different looking world, a time when you could still count Victoria’s breweries on your hands and nobody was walking into a bar and ordering themselves a double IPA. Likewise, the intervening two decades have arguably done wonders for video games too. Both are celebrated here, with the look and feel of the Legend Of The Goat packaging inspired by the Zelda franchise. The beer itself is a double IPA brewed with Italian blonde orange juice – the second orange IPA in recent times, following Pulped Fiction, one of the trophy-winning beers mentioned above. Using a Triforce of Citra, Mosaic and Galaxy hops, which the Goat brewers say are three of their all time favourites, it’s a beer filled with potent citrus aromas and flavours that exist where orange meets mandarin. Offering support are passionfruit and pawpaw, all lined up against a bitter backdrop.